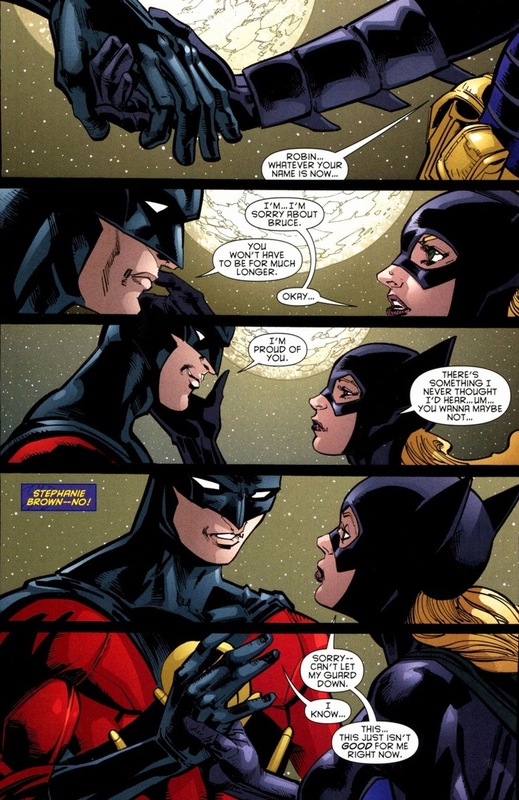 Teenage superhero romance. It’s not much different than real life, except with more jump kicks and ninja attacks. And just like real life, super good-looking kids who are in incredible shape have a fair amount of love interests. 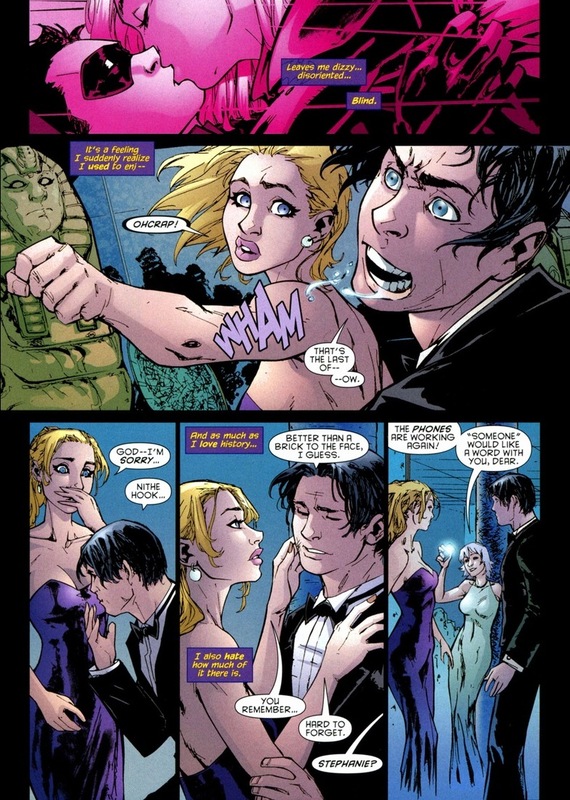 Nightwing’s list of paramours alone would make most sorority girls blush. 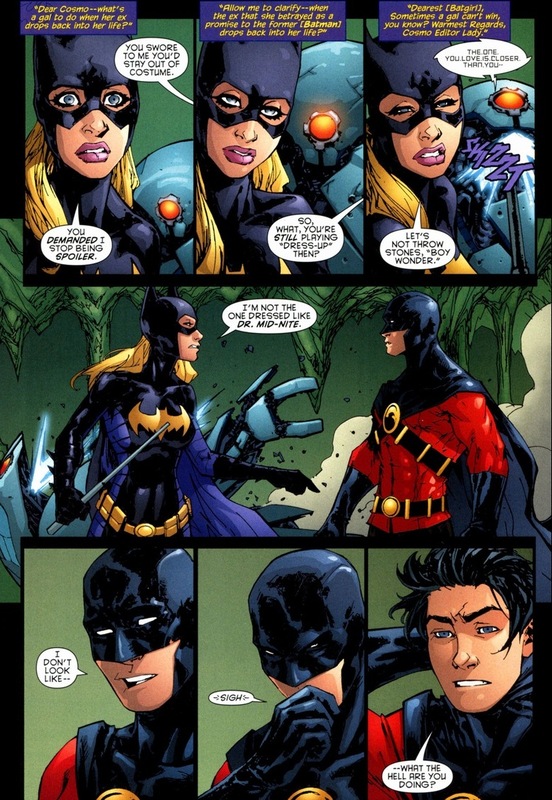 But today, we’re about Stephanie Brown and Tim Drake, the replacement sidekicks. I mean, a couple in the sense that Tim wouldn’t actually tell her his real name or where he lived or any sort of personal details. 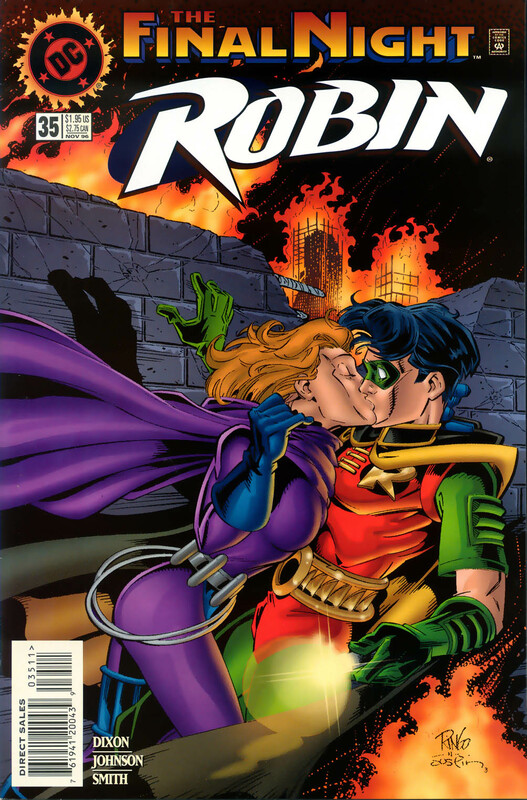 Robin’s fear over Stephanie’s constant danger and his obvious lack of commitment broke the two apart. That and Stephanie got pregnant with another man’s child. Then she died. But probably more of the first reason. 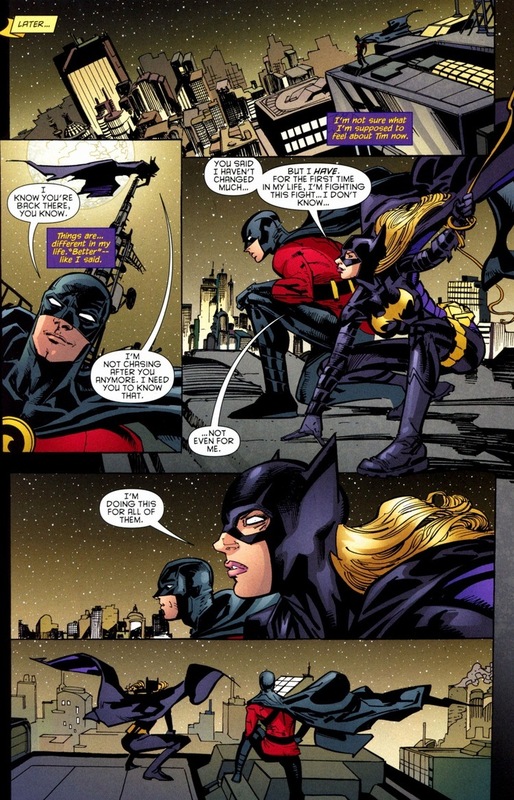 We jump forward more than a decade to Batgirl #8, written by Brian Q. Miller and drawn by Talent Caldwell. 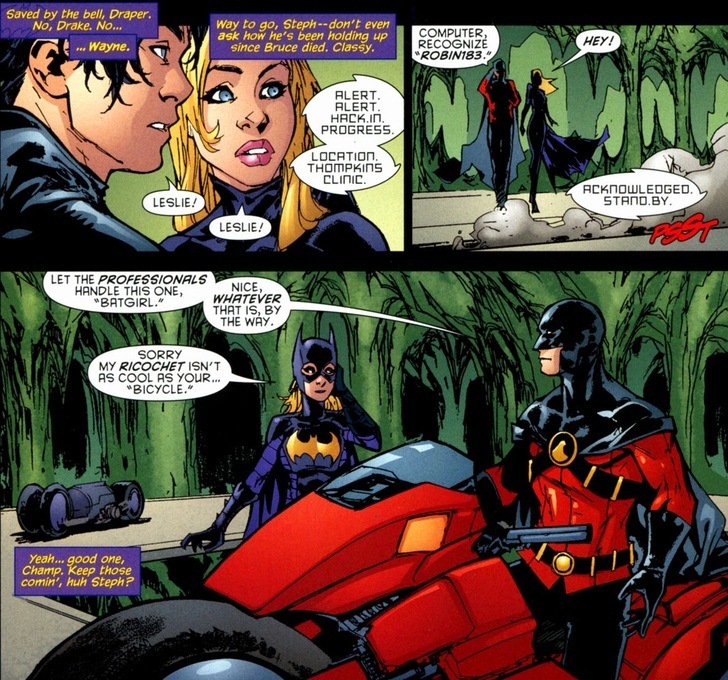 Stephanie has since taken over the role of Batgirl from Cassandra Cain and Tim struck out on his own as Red Robin. So they haven’t seen each other in years. Stephanie’s resurrection took a while and time has changed them both. 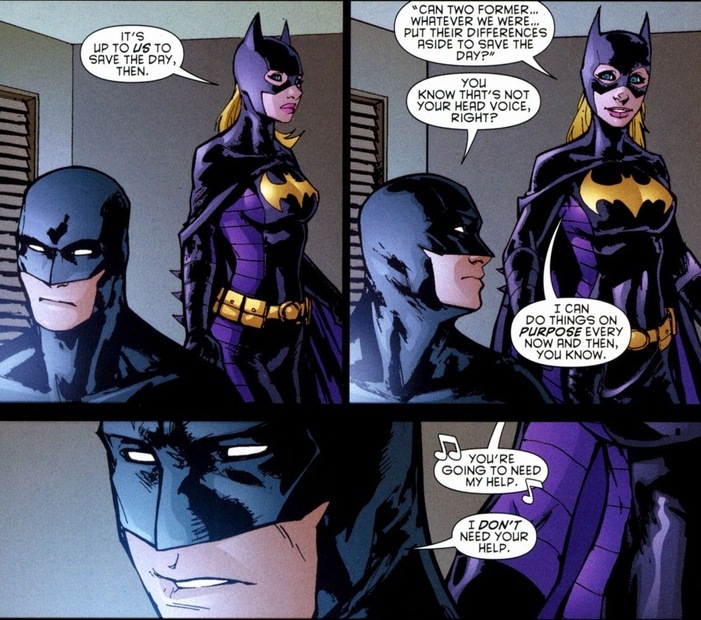 Batgirl’s no longer an untrained mess of a fighter. 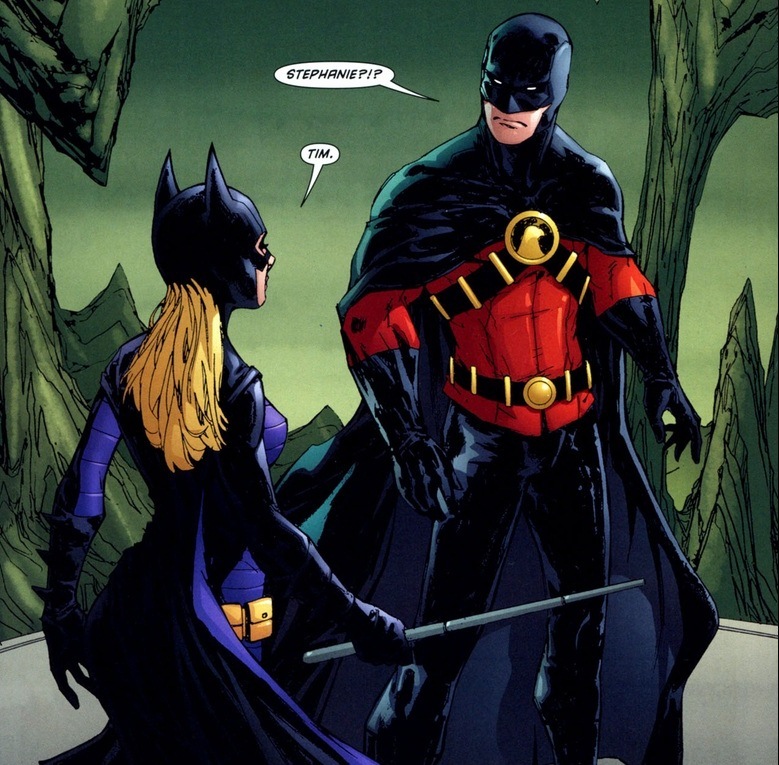 Red Robin’s personality now reflects more Batman than Robin. But the feelings, oh, the feelings never go away. You know what’s coming up next, right? Unrequited love and an overwhelming insecurity? Of course, but I meant team-up. A few years ago, Bruce Wayne died taking down Darkseid. It was super famous, I’m sure you’ve heard of it. Tim didn’t handle the news terribly well. His grieving process changed him into a darker superhero. I’m no doctor, but I assume the tapering off of puberty and being the most dangerous teenage martial artist in the world would most certainly bring out an “edgier” side. Okay, the mission’s simple. 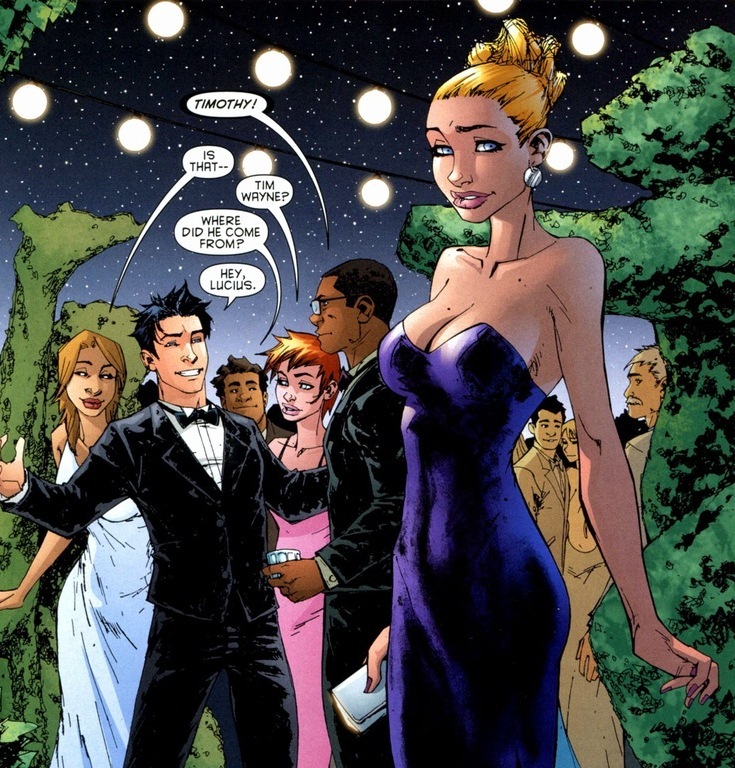 Since Leslie Tompkins (the assassins’ target) is hanging out at a fancy rich people party, Tim and Stephanie will go incognito as themselves. After all, Bruce adopted Tim a few years ago. As you expect, the party takes a sour turn within moments. Ninjas don’t have time to wait for exposition and cocktails. It took me a while to understand what Stephanie means in the above page. I’m no expert of comic book love, trust me. 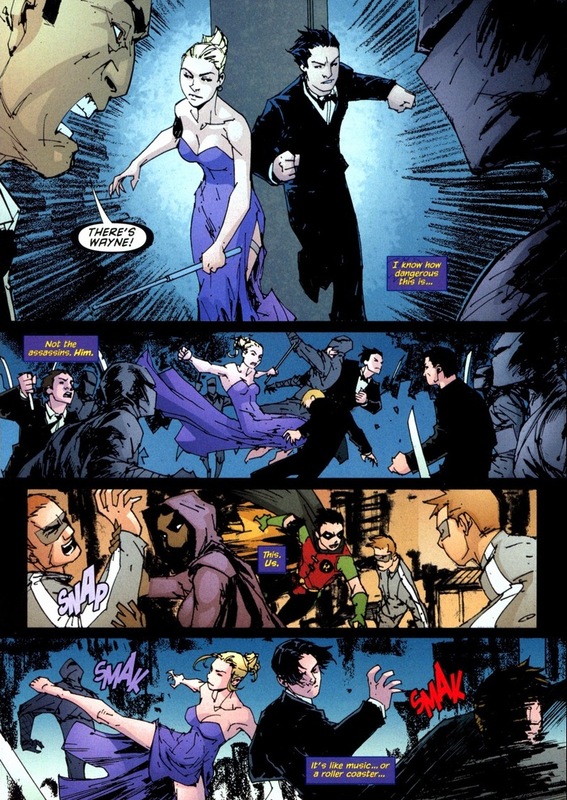 But the “dance” where they fluidly fight bad guys together — that triggers all the old emotions to flow back to the top. Like hearing a song that you and your ex would always listen to together. For superheroes, it’s uppercutting henchmen instead of Katy Perry lyrics. Well, kids, this is it. Tim finally sees Stephanie as an equal and Stephanie remembers why she loved Tim in the first place. Are you excited? Years of will-they or won’t-they come down to the final pages of this issue! The anticipation and suspense has been built so high that the artist forgot to draw in Batgirl’s pupils. And there you go. Rejection hurts. 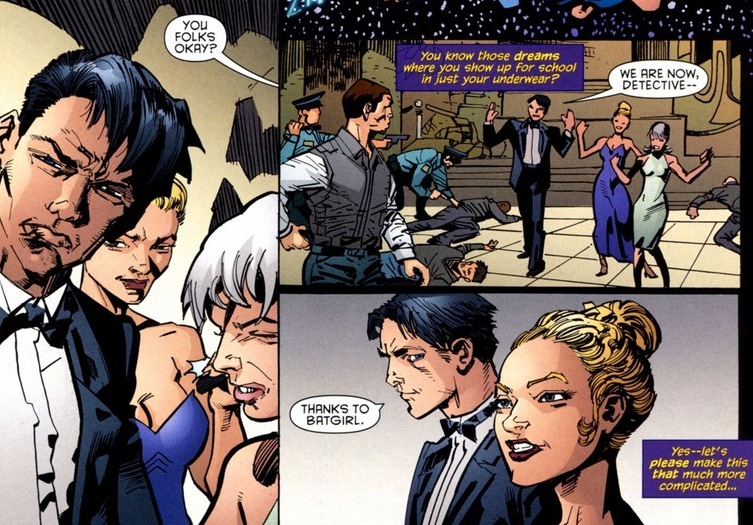 Or it would if Red Robin wasn’t also sort of dating Lucius Fox’s daughter at the same time this is going on. 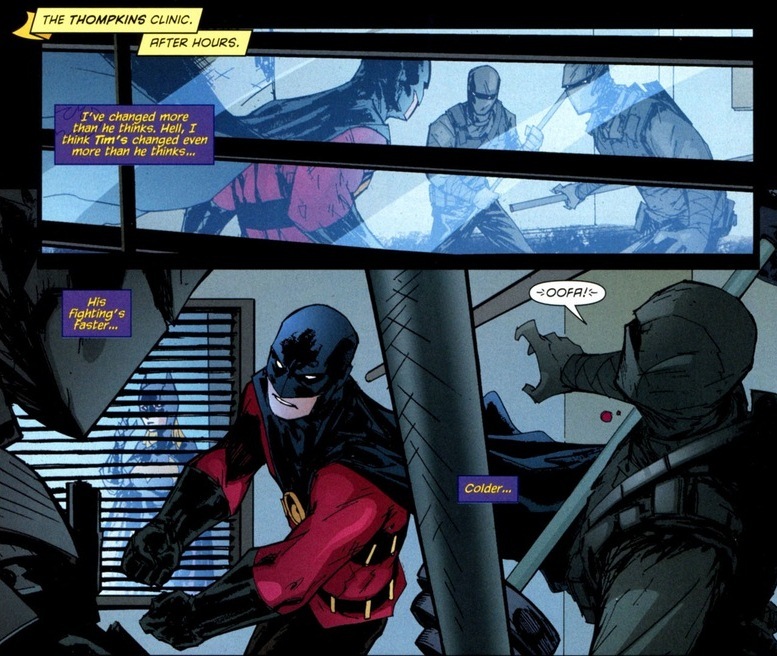 Fighting skills aren’t the only thing Tim learned from Nightwing. I loved Stephanie as Batgirl and am saddened that she’s been virtually wiped from the DCnU. Reading your piece only made me miss her more. I eagerly await her return…whenever that may be. DC always states they plan to bring her back, but nothing’s going on right now. Cassandra Cain’s gone too. It’s not easy being Batgirl. If I had to wager, I’d bet Cassandra will show up before Stephanie does. Really don’t like Cassandra being gone. 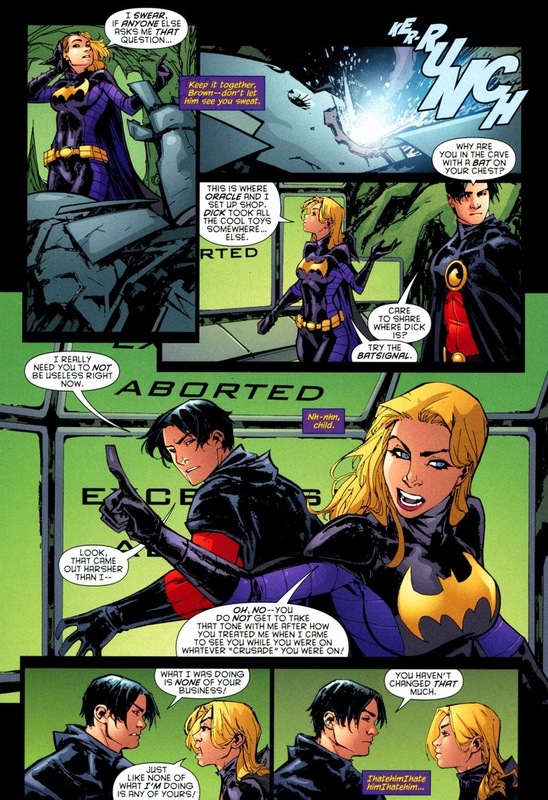 From various interview I read from both the writers of Batgirl and RR, as well as all the subtext in this Xover, they mostly showed that what they had at this point in time was attachment to how they used to be and at this point they had to try and let it go. I’m trying to find the interviews, I can only remember some of Bryan Q Miller where he said “as for Tim, they may run into each other from time to time, but she won’t be seeing him that much. They’ve been through too much together to ignore, and she’ll always have a place in her heart for him. Much to her chagrin” (Broken frontier, 2010) and “It was less about getting Tim’s approval in that issue, and more about letting Tim know that she wouldn’t (as tempted as she was) be falling back on old habits, re: their relationship. The comfort and familiarity Tim provides Steph with are something she sees as a detriment to her development right now.” (Insidepulse, 2010). Obviously it can be read as “they’ll get back together later”, but to me the important part was ‘falling back on old habits’.